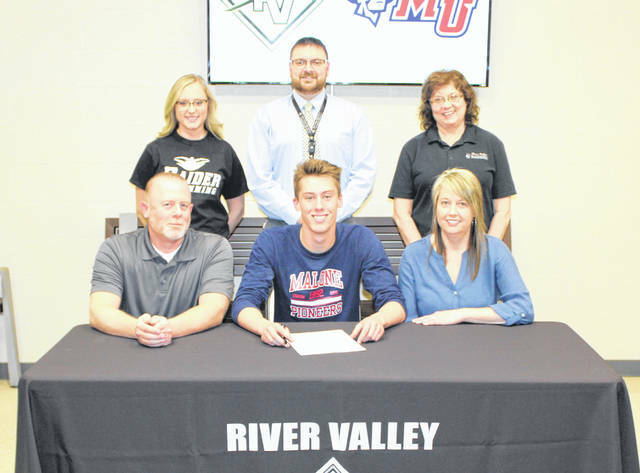 River Valley senior Cole Franklin, seated front and center, will be continuing his swimming career with Malone University after signing on Friday, April 5, at River Valley High School. Cole is joined by parents James and Carrie. Standing in back, from left, are RVHS swimming coach Robyn Schlater, RVHS Principal T.R. Edwards and assistant Regina Rhodes. BIDWELL, Ohio — A road less traveled still leads somewhere. River Valley senior Cole Franklin will be continuing his swimming career after signing a letter of intent with Malone University on Friday, May 5, 2019, inside the lobby area at RVHS. Franklin — a four-sport letterwinner during his time as a Raider — is a bit of an enigma in how he ended up at this point in his life, given that just two years ago he had never competed in a varsity swimming event. Franklin — whose primary athletic interests were running and wrestling early in high school — decided to change things up midway through his junior year, electing to go out for swimming instead of his lifelong favorite wrestling. At first, according to Franklin, he felt like a fish out of water, but his competitive nature allowed him to adapt to his new surroundings. Two full seasons and seven district appearances later, including a sixth place finish in the 100m butterfly at districts this winter, Franklin has proven himself to be at home in the pool. And, as he noted, he’s all so thankful to have taken this blind leap of faith. “It’s definitely interesting and kind of surprising in a sense. A lot of people that go to college for swimming swim year-round, and I’ve been doing this in season for just two years,” Franklin said. “I wasn’t very good when I started that first year, but I was getting some decent results by the end of my junior year. I started training more after that and had a rather explosive senior year, so the work paid off. Franklin has competed in six different relay events at the Division II district level in two seasons, as well as his podium effort this past year. Nobody appreciates the amount of work and progress that Franklin has made more than fourth-year head coach Robyn Schlater, who admits that the senior has been nothing more than spectacular during his time with the program. Malone University is private liberal college located in Canton (OH) and is a member of the Great Midwest Athletic Conference. The Pioneers also compete as members the NCAA at the Division II level. Franklin — who carries a 3.5 grade-point average — plans to major in biology and says that the academics also played a major role in his final decision. But, he also mentioned that Malone itself — both the school and the people — were really what sealed the deal on his choice. “I made a handful of visits to different schools, and I can say that I didn’t quite feel a connection with some of the coaches. I felt right at home with Malone from the start, rather it was the coaches or members of the team. It’s a great school with quality academics and people that you want to be around, so it wasn’t a hard choice in the end,” Franklin said. “I’m a huge fan of science and I don’t exactly know what I want to do, but I do know that I will be getting a nice education as I try to figure things out. Obviously, being a Division II school, I can save some money with the scholarship and start planning for what lies ahead. It also provides some motivation to go out and do well for the school because they are paying me to be here. Cole is the son of James and Carrie Franklin of Gallipolis, Ohio.